A couple of weeks ago, I bought a huge bag of quinoa from Costo. Since today, I haven’t used it at all – mostly because I haven’t truly found a recipe that looked easy enough to make/didn’t require many ingredients. I underestimated how easy quinoa is to make (aka. not adding any ingredients). It takes about 15 minutes on the stovetop, and during that time you can get ready for school – which is what I did this morning! My end result was delicious, and I can see myself making this again and again – until I get brave, and decide to add different ingredients (I have the tendency to stick to certain flavours). Put the quinoa, water, and broth into a pot and wait for it to boil. Once it boils, turn down the heat and let it simmer for about 12-15 minutes (be sure to check it towards the last few minutes). You don’t need to add broth, you can simply add 1 cup of water. Personally, I wanted a flavour infusion. Alternatively, you can add 1 cup of broth, it depends on your taste. In the food processor (I can’t get enough), add the spinach, scallion, garlic, and sundried tomatoes – and process! 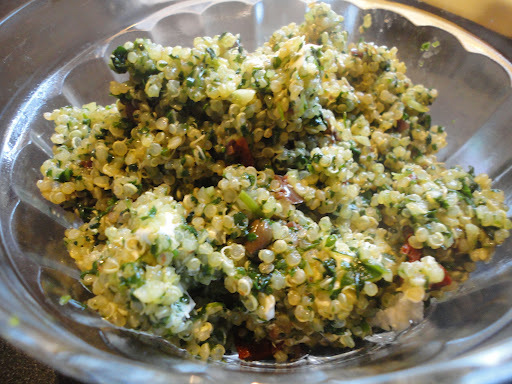 Once the quinoa is done, heat up a frying pan and add about 1 tbsp of olive oil. Mix in the quinoa and spinach mixture, and stir until the spinach loses some of it’s texture. At that point, turn the heat off and add some goat cheese to pan and mix – the remaining heat will somewhat melt the goat cheese. Voila! Lunch is done – time to run for the bus! Do you have any good quinoa recipes? I should really pick up a cookbook!